An abjad is a type of writing system where each symbol or glyph stands for a consonant, leaving the reader to supply the appropriate vowel. So-called impure abjads do represent vowels, either with optional diacritics, a limited number of distinct vowel glyphs, or both. The name abjad is based on the old Arabic alphabet's first four letters—a, b, j, d—to replace the common terms "consonantary" or "consonantal alphabet" to refer to the family of scripts called West Semitic. In written language, a logogram or logograph is a written character that represents a word or phrase. 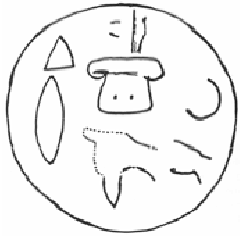 Chinese characters are logograms; some Egyptian hieroglyphs and some graphemes in cuneiform script are also logograms. The use of logograms in writing is called logography, and a writing system that is based on logograms is called a logographic system. 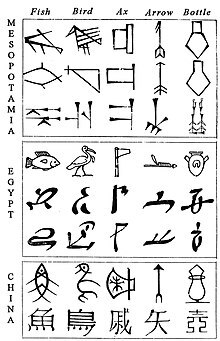 This is a list of writing systems, classified according to some common distinguishing features. There are at least 3,866 languages that make use of an established writing system. 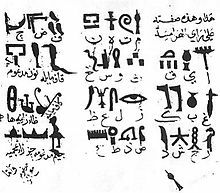 The Meroitic script consists of two alphasyllabaric scripts developed to write the Meroitic language at the beginning of the Meroitic Period of the Kingdom of Kush. 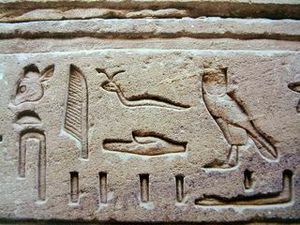 The two scripts are Meroitic Cursive derived of Demotic Egyptian and Meroitic Hieroglyphics derived of Egyptian hieroglyphs. Meroitic Cursive is the most widely attested script, comprising ~90% of all inscriptions, and antedates, by a century or more, the earliest, surviving Meroitic hieroglyphic inscription. Greek historian Diodorus Siculus described the two scripts in his Bibliotheca historica, Book III (Africa), Chapter 4. 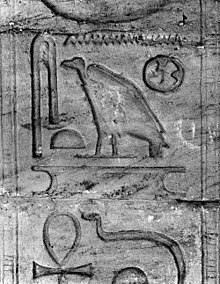 The last known Meroitic inscription is the Meroitic Cursive inscription of the Blemmye king, Kharamadoye, from a column in the Kalabsha temple, which has recently been re-dated to AD 410/ 450 of the 5th century. 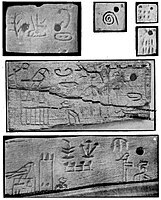 Before the Meroitic Period, Egyptian hieroglyphs were used to write Kushite names and lexical items. 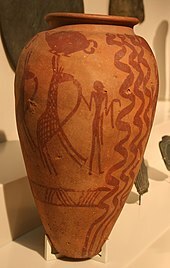 Proto-Sinaitic, also referred to as Sinaitic, and Proto-Canaanite, is a term for both a Middle Bronze Age script attested in a small corpus of inscriptions found at Serabit el-Khadim in the Sinai Peninsula, Egypt, and the reconstructed common ancestor of the Paleo-Hebrew, Phoenician and South Arabian scripts. The Byblos syllabary, also known as the Pseudo-hieroglyphic script, Proto-Byblian, Proto-Byblic, or Byblic, is an undeciphered writing system, known from ten inscriptions found in Byblos, a coastal city in Lebanon. The inscriptions are engraved on bronze plates and spatulas, and carved in stone. They were excavated by Maurice Dunand, from 1928 to 1932, and published in 1945 in his monograph Byblia Grammata. 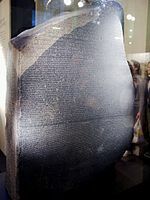 The inscriptions are conventionally dated to the second millennium BC, probably between the 18th and 15th centuries BC.